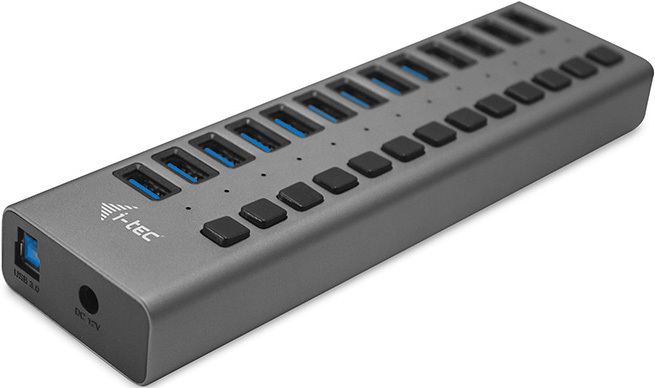 This HUB offers thirteen USB 3.0 ports with the Plug & Play function and with standard USB charging – the HUB automatically detects whether a device for USB charging is connected. 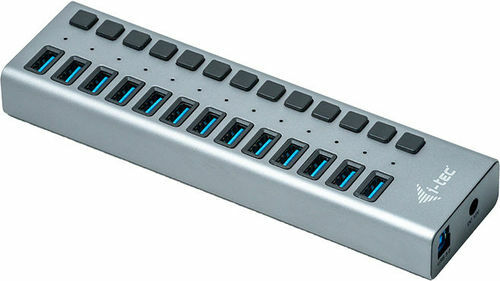 As this HUB is equipped with thirteen USB 3.0 ports, it can charge up to thirteen devices at a time. The USB 3.0 interface is especially important for data transfers from USB 3.0 memory cards and flash drives, where its high transfer rate is most useful. An external power adapter is included in the package to guarantee stable HUB performance and charging from the USB ports, providing up to 10 W of charging power for each port. The individual HUB ports can be switched on/off by the appropriate switch, saving you HUB consumption while increasing the charging input power on the ports you leave on. This HUB does not require the installation of drivers. You will just connect it by the USB cable to your computer and immediately you can start using it. This HUB has a built-in overcurrent protection of your computer in case of short connection on the peripheries. The interface is compatible with USB 2.0 / 1.1. The HUB is installed automatically from the system and does not require any drivers. Connect the AC adapter connector to the HUB and the AC adapter to a 230 V outlet. Then connect the HUB via the USB cable to a free USB port (USB 3.0, 2.0 or 1.1 standard) on your laptop/PC and follow the instructions on the screen. The HUB will be installed and displayed in the Device Manager as “General USB Hub” and “General USB SuperSpeed Hub”.